If you want to straighten your teeth without resorting to orthodontics, dental veneers are your best option! This cosmetic dentistry treatment corrects minor teeth misalignment instantly, so there’s no need to spend years of your life wearing braces or aligners on your teeth. Dental veneers are for those who want an immediate smile transformation, in time for a formal event or get-together. In as little as 2 to 3 appointments, your teeth are aligned, minus the inconveniences associated with orthodontics. Dental veneers make life simple, providing that much-needed aesthetics instantaneously. A dental veneer is designed to mimic the appearance of real teeth. It is a thin shell, made of porcelain, adhered to the front or visible side of your teeth. A very thin layer of a tooth’s enamel is removed, to give space for a dental veneer. The veneers are then bonded onto the prepared teeth. Dentists can easily design your smile with veneers because they can shorten or lengthen a tooth, cover a gap, mask chips, cracks and discoloration, and correct misalignment. With the use of veneers, your dentist becomes an artist who skillfully designs and transforms the look of your teeth. The outcome is a beautiful smile transformation with teeth that are very much aligned, brightened, and picture perfect. Dental veneers make it possible to align the teeth without taking orthodontic treatment. What are the Misalignment Levels that Dental Veneers can Handle? 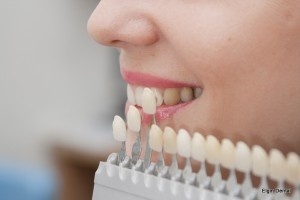 Dental veneers can handle mild to moderate misalignment issues. It is still best, however, to consult with your dentist about taking dental veneers for straightening the teeth. In most cases, dental veneers can address oddly spaced, uneven, or crowded teeth effectively. One thing that you must consider is that dental veneers are permanent. The process involves bonding the veneers to your teeth, which is a relatively irreversible procedure. You should also bear in mind that dental veneer bonding involves removing a portion of your tooth’s enamel, which makes it a somewhat invasive treatment. One good consideration, however, is that dental veneers are durable and stain resistant. They can last from 10 to 15 years with proper oral hygiene and dental maintenance. Many patients don’t mind allowing the dentist to remove a portion of their teeth’s enamel because dental veneers offer permanent, long lasting results. There’s also no need to wear retainers to retain your straight teeth as in the case of orthodontic treatment. While it’s true that dental veneers have their share of disadvantages, the fact remains that they straighten the teeth the moment the bonding procedure is complete. You basically come out of our practice with aligned and picture perfect teeth. Our practice takes pride in having a well-loved dentist, Dr. Kim C. Norman. He is a dedicated dental professional ready to listen to your needs and goals about teeth misalignment and many other concerns about the teeth. Dr. Norman can discuss dental veneers further with you, as well as your other dental treatment options. He will help you make a well-informed decision about the dental treatments you should take advantage of. Schedule your appointment today by calling us at (865) 982-9662!